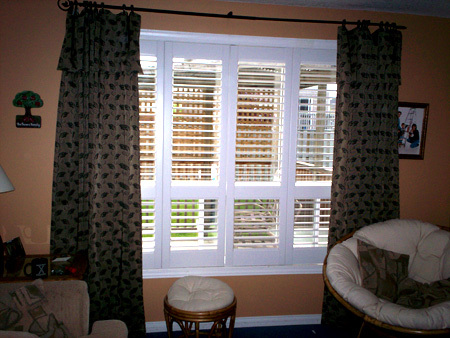 Shutters add stylishness and luxury to any window. Privacy and lighting are easily controlled. Energy-efficient, shutters keep out summer’s heat but in the winter, keep the warmth in. With a range of colour from cool white to mocha and offering louvre sizes of 2.5″, 3.5″ and 4.5″, the flexibility of shutter dimension and colour lets us install the product best-suited to the dimensions of your windows and doors. Premier-grade Polysilk vinyl shutters are ideal for high humidity or wet environments. Operation features include the traditional tilt bar, mini tilt bar, or internal-geared Polysilk shutter. Polysilk shutters are Envirogreen™ and do not emit VOCs. Certified by GREENGUARD™ with the GREENGUARD™ Indoor Air Quality Certificate, these shutters are approved for schools and retirement living. With their many features, Polysilk shutters are an ideal solution for residential, commercial and hospitality applications.